Somewhere around the end of October I switch to my winter lunch – soup, preferably homemade, with a chunk of interesting bread. 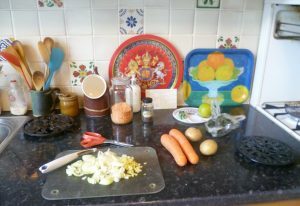 And carrot and coriander soup with lime and ginger is one of my favourites. There’s something very soothing about the process of soup-making, and I recommend it if you’re feeling frazzled. 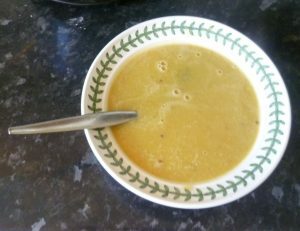 2 large carrots, 1large onion, 2 cloves of garlic,1 knob of ginger, 3 tablespoonsful of lentils, 1 medium potato, ½ a teaspoonful of black mustard seeds, 2 vegetarian stock cubes, 1 lime, a knob of butter and a handful of coriander (or ½ a teaspoonful of ground coriander). 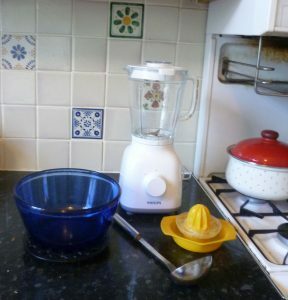 A large (2 litre) saucepan, a large 2 litre bowl, a kettleful of boiling water, a liquidizer, and a lemon squeezer. The great thing about the ingredients is that they are adjustable. I have no idea how big a ‘knob’ of ginger or butter, or a handful of coriander is, for example, but it doesn’t matter. Soup-making is very forgiving about such things. I buy a large bunch of coriander from a stall in Chapel Market. I wash it, put any fresh coriander I want in a glass of water on the kitchen windowsill until needed, and I divide the rest into ‘handfuls’ and freeze each handful in a small plastic bag. I like to get what I can ready before I start, so I chop the onion, garlic and ginger and put them on a plate; chop the carrots and potatoes, ditto, and get out the lime, the lemon squeezer, the jar of lentils, the mustard seeds and various spoons, knives and my lovely left-handed scissors (useful for cutting up the sliced ginger), and the two stock cubes. All this makes me feel efficient. This doesn’t happen nearly enough in my life, so I have a complacent moment enjoying the feeling of being in control of my materials. I’m ready to go. 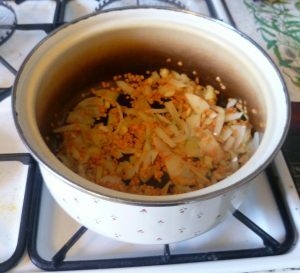 I fill the kettle and turn it on (giving myself a tick for remembering) before melting the butter in saucepan, adding the chopped garlic, onion and ginger and cooking it gently until the onion is transparent. Then I add the lentils and fold in, followed by half the now boiled water. The soup is simmering in the background. The liquidizer, bowl and ladle are waiting – as is the lime. Next, I add the chopped carrots and potatoes, the mustard seeds and the stock cubes. Then I take out the frozen block of coriander from its bag and add that, too. I add the rest of the water in the kettle which more or less reaches the top of the saucepan and let it all simmer. 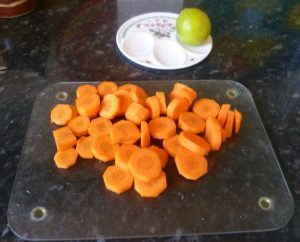 It’s ready when the carrots, potatoes and ginger are cooked – twenty minutes to half an hour. Again, the joy of making soup is that you don’t have to time it to the dot. While I’m waiting, I squeeze the juice of out the lime. It doesn’t need to go in until the end. I try to keep the lime juice visible, it’s all too easy to forget to add it. 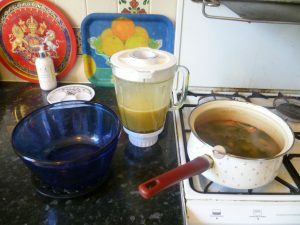 Lastly, I add the lime juice (another mental tick) and salt to taste, and then liquidize the soup and pour it into my large blue bowl. It’s ready, and I sit down to my winter lunch of a bowl of soup and some bread. Later, when the rest of the soup has cooled, I freeze about four portions and put the rest in the fridge. In total, it makes about seven three-ladlesful helpings. This soup is a variation on an original theme. 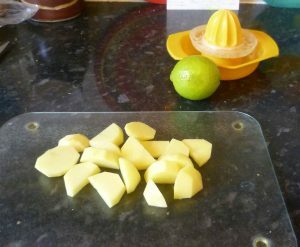 The original recipe had two limes which I thought sounded too much, and it didn’t include the potatoes. However, I like my winter soup to be thick and warming, and potatoes do that very well, as do lentils. Mission accomplished. My soup is ready. The other thing I enjoy, and I’m sure I’m not alone here, is using utensils which remind me of friends, or loved ones who once owned them, or places I acquired them. 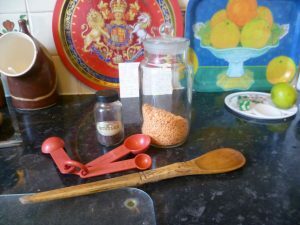 My wooden spoon, for example, is one of a pair which a friend brought me back from Tanzania. I bought the spoon rest many years ago when I visited that extraordinary place, Portmeirion, in Wales. 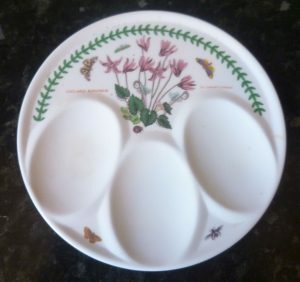 At first, I wasn’t sure what it was for but I’ve found it very useful to rest spoons on whilst cooking; or to hold eggs, or anything which might roll, safely; and it looks after knobs of ginger and stock cubes until I want them. My saucepan’s stamp. Does the factory still exist, I wonder? 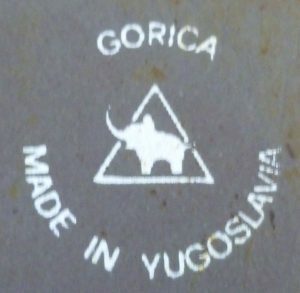 I bought my large saucepan (one of two) from Woolworth’s many years ago and underneath it, it says Made in Yugoslavia. It’s given me excellent service over the years and it’s bright and cheerful to have about the place, too. And, I suppose, it’s practically an antique! What a great variety your blog contains! I can practically smell the lovely aroma of hot, delicious soup. I’ve just searched for ‘Gorica saucepans’ – one is for sale on a site which describes it as, ‘Vintage Retro Gorica Yugoslavia Saucepan Pan with lid Enamel Floral Kitchenalia £18.99’! Good heavens! Thank you for your sterling work on my saucepan’s provenance, Prem! I’m thrilled to know it’s now Vintage! Your soup sounds delicious Elizabeth. I love a good thick vegetable soup in the winter. My favourite is heavier on the lentils than yours and has touch of curry too – both warming and sustaining in the cold weather. I love serving it in my Mexian bowls bought on our wanderings a long ago by the roadside in the wonderfully named Tzin-Tzun-Tzan in Michicoan. They have bounding rabbits in slip under the green glaze. So cheerful and lively. Your soup bowls sound wonderful, Pauline! Thank you for joining in. I can see that a touch of curry would be very warming – and turmeric, especially, is supposed to be very good, health-wise, too. Got a kick out of your Portmeirion spoon-rest. Puts me in mind of Patrick McGoohan and The Prisoner: for me, a much-loved bit of whimsy from your side of the Pond! Here (West coast, N. of San Francisco) we call fresh coriander Cilantro, very popular in Mexican and Californian cuisines and you can always find it fresh in the markets. To confuse matters, the seed-form remains “coriander”, however. If you can find them, someday try using Thai (aka Kaffir) limes: a whole new level of lime intensity and incredibly fragrant into the bargain. Highly recommended. Your “liquidizer” threw me for a moment. Us colonials call that a blender! Thank you for dropping by, Steve. This may be a language problem but why did you get a kick out of the spoon rest? It means somewhere to put spoons you’ve been using so that the worktop doesn’t get dirty – rather than them being exhausted with all that cooking and needing a lie down. Thank you for telling me about Cilantro, which I didn’t know, and for the info about Thai limes – I’ll keep an eye out for them. I hope you enjoyed ‘My Family and Other Animals’. His other books about his trips as a young Zoo Keeper in the 1950-60s to collect animals are also very engaging. Oh, not the fact of the spoon-rest itself, just that it came from Portmeirion, a very kitschy (and apparently kitcheny) yet compelling locale from my perspective. The Prisoner, a somewhat avant-garde ITV show from the ’60s, was filmed there and I am fond of both the show and the location. Little bits in your posts keep finding resonance with me. Corfu, where I lived as a boy; your stroll about the tow-path and waterway (figures in C.S Forester’s works, with which I am very familiar); and now Portmeirion. What next? “My Family…” was very close to completely magical. Have moved on to his follow up: “Birds, Beasts and Relatives” plus have “The Garden of the Gods” and “Whatever Happened to Margo?” on tap. Guess I’ll have to break down and read Larry’s stuff too. Thank you for your interest in my posts, Steve. I can see that you will keep me on my toes! Laurence Durrell’s books are a very different kettle of fish. > …different kettle of fish. Um, so I’ve gathered. Figure I’ll start with Prospero’s Cell. Believe it or not, I woke up this morning thinking about your soup. Well, this *is* a cooking day for me. Thus, the chef’s thought occurred: cinnamon. To my palate, that one addition might add a welcome and warming note of comfort and a new layer of complexity to your symphony of ingredients. I’m not suggesting you add a lot – just enough to tickle the taste buds. Thank you for allowing me to barge in, unannounced as it were. Thank you for your hospitality. You are most kind. Back on track with the food thread: Today am up to my elbows in a Ragù alla Bolognese. Am just soaking a pound of dried Porcinis – all the other ingredients having been previously prepared. Will end up with 12 or more quarts to be put up in freezer which will last the year. Terribly funny, those tired spoons of yours needing a lie down. The wife and I had a good chuckle over that!